Photo by Farm Chick Photography. 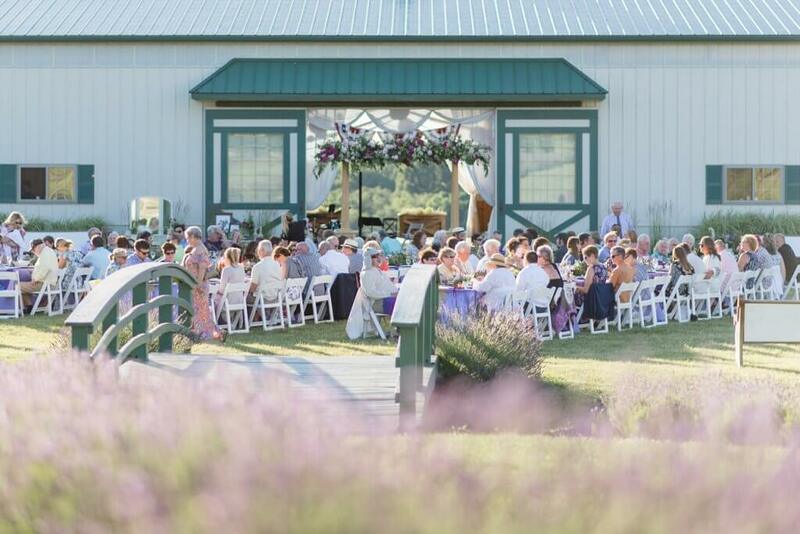 Our Field to Vase Dinner at Destiny Hill Farm in Western Pennsylvania will go down as our miracle dinner. Tornado warnings were sent to all of our phones. 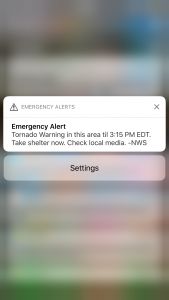 Just twenty-four hours before our dinner began, Washington, Pennsylvania was under a tornado warning as a severe storm ripped through the area. We were all in a pre-dinner planning meeting when emergency alerts started ringing everyone’s phones. I was so impressed with receiving my first “tornado warning” alert on my iPhone that I took a screen grab of it. The storm was intense. Lighting, booming thunder and sideways rain; it had everyone running for cover. By Saturday morning the extreme rain and wind had died down and made way for a beautiful day as we prepared for our Field to Vase Dinner later that evening. While we fought a little wind during set up, by the time our guests sat down for dinner the weather could not have been more perfect for our celebration of American Grown Flowers. 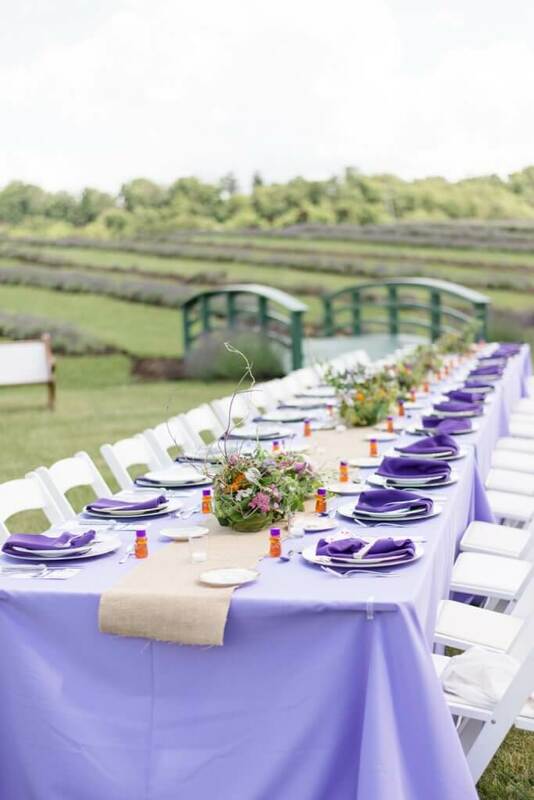 The lavender fields of Destiny Hill Farms were a beautiful backdrop for our American Grown Field to Vase Dinner. Photo by Farm Chick Photography. 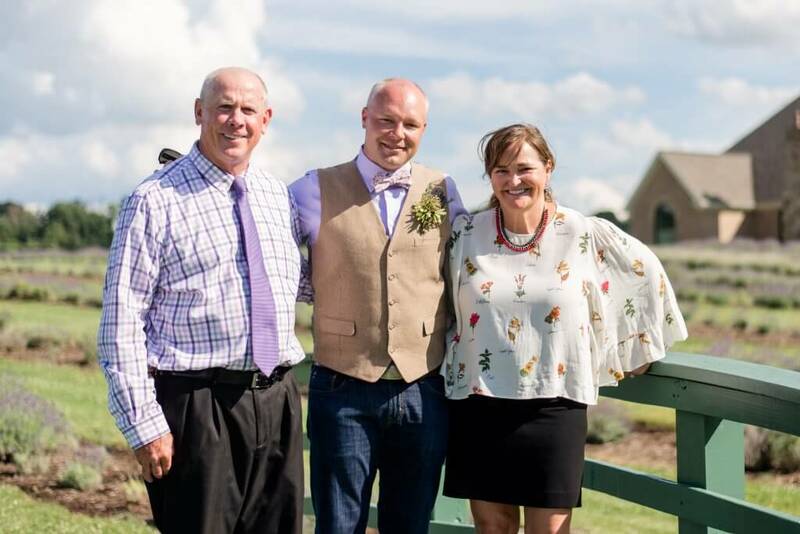 Now, Destiny Hill Farm is one of the most beautiful flower farms in the United States, but what makes this farm so special is the family behind the farm. The Cameron’s are a generous, fun-loving family that make everyone who visits feel like family. I also had a chance to work with an amazing team of employees and student interns who helped us make a magical evening come true for our dinner guests. 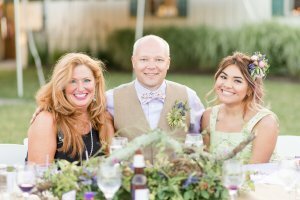 Our guests enjoyed a magical evening on the flower farm. Photo by Farm Chick Photography. It was a privilege to finally meet Jim and Nancy Cameron, early adopters of the Certified American Grown Flowers program. Photo by Farm Chick Photography. 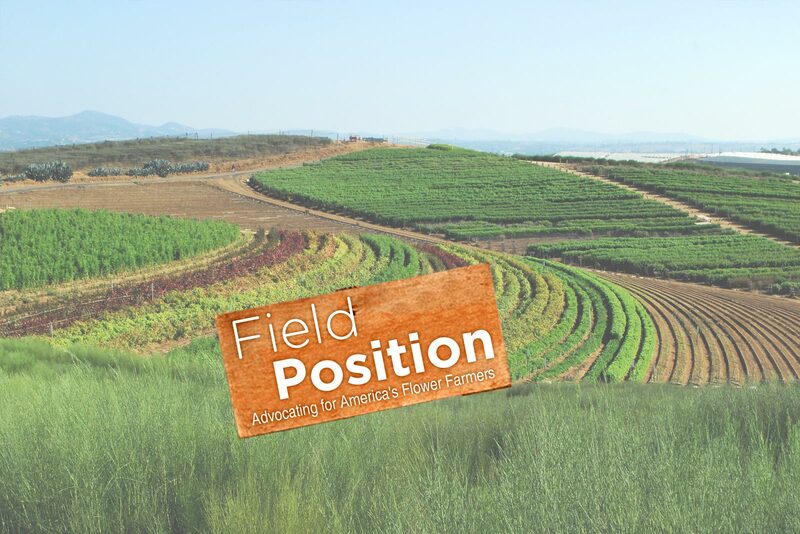 Jim and Nancy Cameron were early adopters of the Certified American Grown program and it was a privilege to finally meet them in person and host a beautiful American Grown Field to Vase Dinner on their flower farm. They not only rolled out the red carpet (or purple carpet, as the case may be) for our guests, but they get the award for the most organized set up. Mimi York (left) did an amazing job as our event planner for our dinner at Destiny Hill. Niesha Blancas (right) helped us capture the magic via social media. Check out her facebook live interviews! Photo by Farm Chick Photography. Mimi York, Destiny Hill’s resident event planner, had our table set on Thursday before the event. That was an F2V first! Mimi was a true pleasure to work with and it was her attention to detail that really helped ensure our guests had a memorable evening. Of course any mention of our time at Destiny Hill would not be complete without mentioning Luther. In fact, Luther might have stole the show. Luther, the farm mascot is a miniature donkey that was rescued by the Camerons and basically roams freely on the farm. 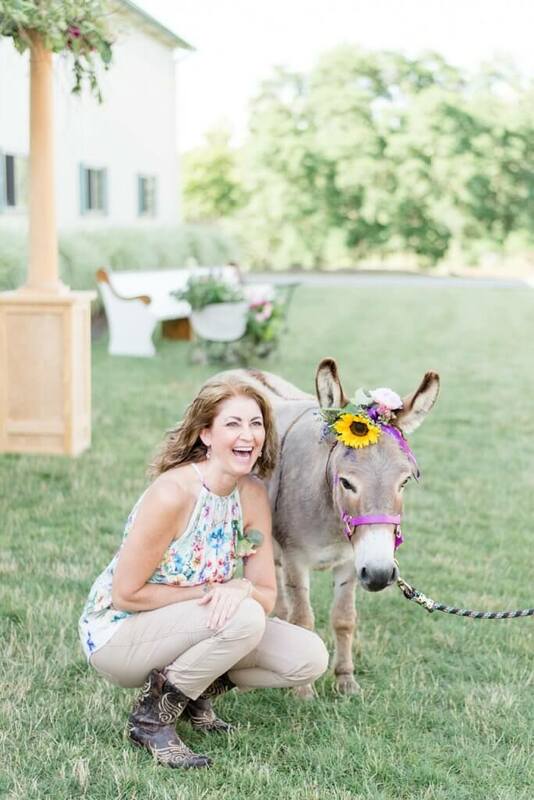 There is nothing quite like having a donkey greeting your guests to bring smiles and levity to any event. Who doesn’t love a miniature donkey at a party? I could write a whole blog post on Luther. Photo by Farm Chick Photography. You can find more beautiful images of our dinner at Destiny Hill Farm on our Flickr page. 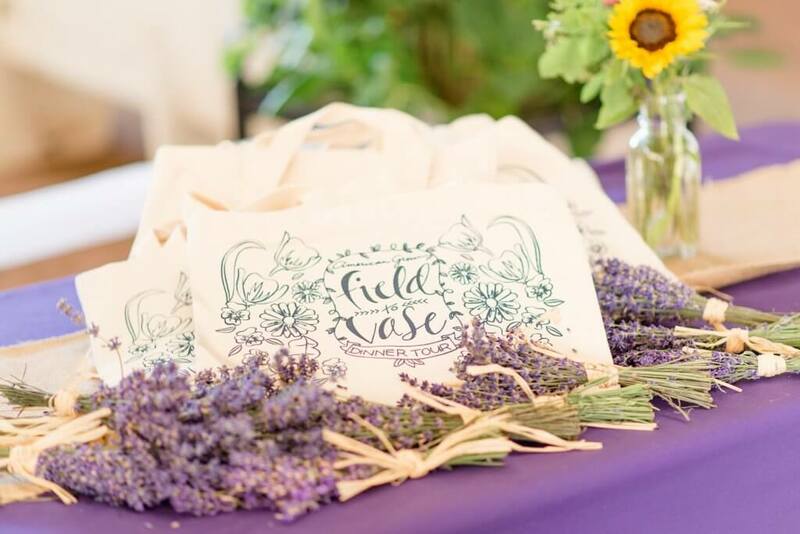 Thank you to MacKenzie Scheponik of Farm Chick Photography for such beautiful photos. Click to see more photos from our American Grown Field to Vase Dinner at Destiny Hill Farm.